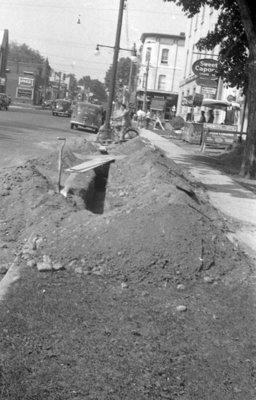 A black and white negative of a trench dug by Whitby Hydro along the right side of Dundas Street East. The intersection of Brock Street and Dundas Street can be seen in the distance. Whitby Hydro Trenches, August 1939, Marjorie Ruddy. Whitby Archives A2013_040_048A.